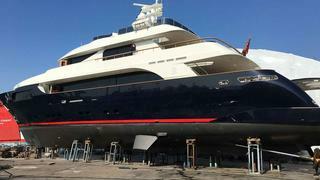 The 38 metre motor yacht Amapolla has been sold by Murat Urusov at West Nautical, acting for the buyer and seller. Built in aluminium to RINA class by Italian superyacht builder Rodriquez to a design by Francesco Paszkowski and MCA compliant, Amapolla was delivered in 2008. Her interior, also by Francesco Paszkowski, accommodates 10 guests in five cabins. The master suite is full beam and has a dressing room while two VIP double suites have queen sized beds and there is a pair of twin cabins. All cabins have entertainment systems including television screens and all have en suite bathroom facilities. The decor throughout is in cherry wood with walls covered in fine fabrics accompanied by classic furniture to create a warm, English style ambience. The expansive saloon has comfortable seating on settees and occasional chairs and comes complete with a bar and entertainment centre featuring a home cinema system. Twin 1,825hp Caterpillar engines give Amapolla a cruising speed of 18 knots and maximum speed of 20 knots and she is fitted with zero speed stabilisers. Lying in Greece,_ Amapolla_ was asking €5.5 million with VAT paid.